Tamara Johnson has a longstanding interest in the nation of South Africa. She recently returned from the country after leading a group of UNC Charlotte students who participated in a program on sustainable farming in association with Stellenbosch University. Johnson, research associate for academic planning and analysis in the Provost’s Office, helped guide this international learning initiative. She views this type of global experience as an extension of her role on campus – to highlight the work University faculty and students are doing related to community engagement. 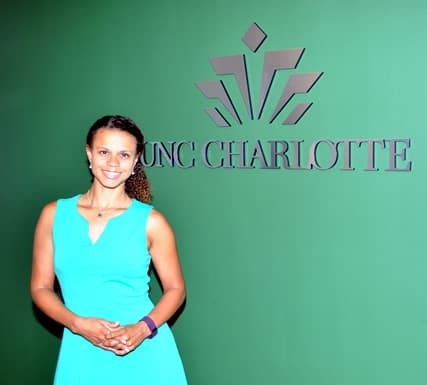 While recent trips to South Africa have been to Cape Town, Johnson spent more than two years in the Limpopo Province as a volunteer with the Peace Corps after graduating from UNC Chapel Hill. She earned a bachelor’s degree in geography and international studies. She would return to South Africa for her doctoral studies, using a Fulbright grant to study at the University of Cape Town as an affiliate with the Center for African Studies and the African Center for Cities. Her Ph.D., also from UNC Chapel Hill, is in geography. Johnson joined the University in September 2011, initially with the Office of International Programs. During her tenure in the Provost’s Office, she has worked with students to promote voter education and helped organize a symposium related to hunger. She is working with faculty members on an event around housing for the spring. In addition, Johnson is a liaison to the N.C. Campus Compact. Beyond campus, Johnson enjoys cycling, standup paddleboard and hiking with her three-pawed dog Layla. She’s trying to learn more about home repairs to tackle several “do-it-yourself” projects, too.